Voting for the Laugh Out Loud Awards is now open, and we want to get as many schools involved as possible! We’ve come up with a short guide to voting in the Lollies – read on to find out more. 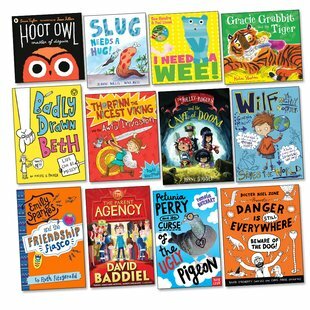 We designed these awards – categorised by age group – because we know that funny fiction for children is invaluable; a book that makes them laugh out loud could be the start of a lifelong relationship with books, and that’s the journey we wanted to create with our shortlist. Here are six tips for making the most of these brilliant books in the classroom, and getting your pupils excited about choosing their favourites. These are the kinds of books children should be excited about – they’re fun, not work! So, we’ve created a series of free, downloadable activity sheets for all twelve books you can use to build enthusiasm and get children looking forward to getting stuck into the stories. Perfect for using in class or at home. These books are great fun to teach, we promise! If you’d like to use the books in more detail then every shortlisted book comes with its own expertly conceived lesson plan, with information on how they fit into the national curriculum and how you can incorporate them into your teaching schedules. They’re all free and take seconds to download – you can find them all here. There are plenty of ways to introduce the Lollies books in class! They would be great read aloud to the class as a whole, or given as reading group activities for smaller, more advanced readers. If you have focused groups for those who struggle with reading, these funny, light-hearted books are a great tool for engaging even reluctant readers. Your students will love having the choice on who you vote for and maybe even who wins! Alternatively, if they don’t fit into your teaching schedule, order some for your school library and have a ballot box where children can vote for their favourite once they’ve read them! Don’t worry if you don’t have time to read all of the Lollies books or can’t afford to buy a pack for your classroom, we’re featuring double-page extracts from all twelve books on our website that could easily be used for a Lollies-themed lesson. Your students could decide their favourite based on looking at the different writing styles or characters. It is a quick and easy way to read parts of all four shortlisted books. Find picture books here, 6-8 years here, and 9-13 years here. Once you’ve chosen your favourite, it takes seconds to submit your vote online. Simply sign in, and select your class’s favourites – then click submit! If you don’t already have a Scholastic account, it only takes a couple of minutes to set one up for your school. And remember – every teacher gets automatically entered into a competition to win a class trip to the awards ceremony when they place their vote! If you’re a parent, take a look at our quick guide to getting your child’s school involved with the Lollies. It’s nearly time for half term! The coldest, drizzliest part of the school year is almost over, and we’ve got a week to recuperate without the daily demands of the school run.